A soccer summit to unite the majority of US clubs and leagues under one common successful goal. Time frame: Ideally within the last week of November or first week of December 2017. One to three days (max). Ideally NYC – the financial capital of the US and the world – at a Manhattan hotel convention space. (Just like the original US national soccer summit which formed the USAFA / USSF in 1913). For the greater good of the game, and the short and long term financial success and growth of all US soccer clubs. The Time To Unite Is Now! In the USA, there are thousands of professional and amateur clubs, and multiple leagues and regional associations, but the vast majority are independent of each other. Though all form under the United States Soccer Federation (USSF), these individual organizations have no true cohesive link or common plan that creates consistent financial benefits to themselves or to one another. The majority of these groups, unfortunately, are left to figure things out on their own and to try to build their individual products. In the process, for the past 100+ years since the formation of USSF, thousands of clubs and dozens of leagues have also come and gone. It is a cycle of clubs and leagues appearing and disappearing for over a century because there is no real unity or plan to maintain longevity and success. In a global sport such as soccer, where everyone from top to bottom is and should be connected – especially within their own nation, this isolationist framework can no longer persist. It must end for the best interest of the game in order to bring about greater opportunity for everyone wanting progress and a more viable and profitable approach. US clubs, leagues, and regional associations can longer work alone and remain as dispersed factions of the sport (whether due to pride, greed, selfishness, bickering, forced placement; lack of proper contact, awareness, true guidance, resources, financial incentive, potential investors, or any other influential reason) as this has significantly hindered the growth of the sport and will continue to do so at the peril of everyone involved if it is not brought to a full halt. These groups can no longer remain divided or isolated. The sport of soccer in the US, if it is to reach far and beyond its current status to the levels of the top soccer nations of the world, must be approached with a coherent vision and true unity. At this summit, clubs, leagues, regional associations, and fans must come together to learn from the undeniable past in the US as well as the visible structures in place around the world, and realize that their true strength and profitable potential is in their combined numbers. They must unite, collaborate, and form a true common goal. They must work together under one umbrella and form the first national multi-level US soccer pyramid with Promotion and Relegation and meritocracy, which will include the right financial design to ensure stability, sustainability, longevity, and financial success for everyone. Upon coming together, the clubs, leagues and regional associations must form a Multi-Regional / National Association which will be able to equally represent them no matter where in the promotion and relegation pyramid they are found. This association will strategically be a member affiliate to the USSF. The association’s goal will not be to first seek independent or direct sanctioning from CONCACAF and FIFA, as it will automatically have it via USSF. This way, the association can receive immediate recognition for its clubs and leagues to begin play in 2018, and neither the new association or the clubs and leagues forming under it can be treated as outlaws or renegades. USSF must recognize it (under explicit USSF bylaws) because as a member association it will meet the affiliate association criteria. The new association will make it clear that it wants to be affiliated with USSF during its formation. The new association will recognize the historical NASL as the national D1 and D2 of its own association, NISA as the national D3, NPSL as the national D4, and all other associations as the regional D5s and D6s of its association, where leagues connect through promotion and relegation and clubs eventually enter the divisions based on merit of play like around the world. The USSF Professional League Standards (USSF PLS), without some people fully realizing it, is one of the top issues within all of soccer in the US as its arbitrary design limits the growth of the majority of clubs and leagues seeking to be viewed and treated as top caliber (or D1). 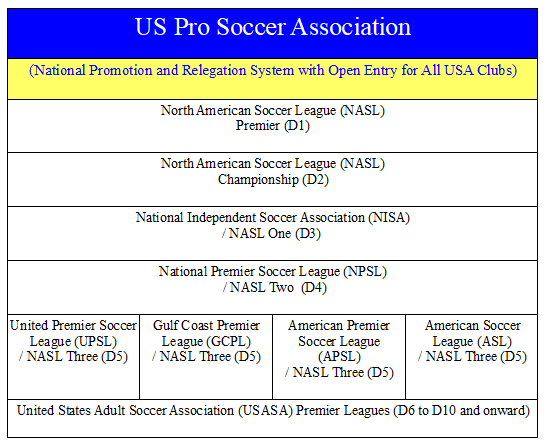 As shown in a previous document (https://www.docdroid.net/5rVf5FK/how-the-north-american-soccer-league-nasl-can-truly-win-against-the-united-states-soccer-federation-ussf-by-isaac-payano.pdf), the complete USSF PLS for USSF D1 can only be achieved by a very small amount of people in the USA (approximately 0.02% out of the entire US population of 300 million+). Though the USSF PLS is an issue that needs to be resolved, there is a way to move forward while it is in place. 2) Additional Specific Division Standards (for USSF D1, USSF D2, and USSF D3). A professional soccer league in the US must meet the first part under USSF, but has the option to meet the second part if it is specifically seeking a USSF division. Similar to an independent, non-division, professional league that is still recognized by USSF, the new association and its clubs and leagues that are professional must only satisfy the first criteria. They don’t have to pursue USSF D1, D2, D3, which only real benefit is to have late entrance in the US Open Cup. The new association, its clubs and leagues can bypass many of the arbitrary rules of the USSF PLS that limit their growth, particularly found in the second criteria. The new association and its clubs and leagues will satisfy the first part of the USSF PLS, as mandated by USSF, while it’s clubs and leagues can set their own additional standards and setup their own D1 to D10+ divisions. Forming this new association gives the independent pro and amateur leagues and clubs a proper place. Furthermore, the USSF PLS mandates teams to participate in the US Open Cup only under the second criteria. In other words, clubs in the new Association will still have the opportunity to enter the US Open Cup, similar to the USASA – likely in the beginning rounds, but won’t have to be forced into it as it is not part of the first criteria. A separate multi-regional cup can be formed between this new association and the USASA which will not impede the pro and amateur clubs from participating in the US Open Cup. Furthermore, another cup game can also be formed between the top three or five divisions within the association, similar to the English League Cup or Scottish League Cup, and the historical ASL Cup / Lewis Cup in the USA. A permanent President and cabinet will eventually be formed for this association. In the interim, a temporary committee will be established during the summit by one to two members of each league. As the parties in the summit have joined under a common goal and have formed a new association, the next step is to implement a truly functional Promotion and Relegation design that is specifically tailored to the needs and geographical landscape of the country, which has multiple time zones and regions with large travel costs. When it comes to this combined system, it is about short / immediate and long term success through stable and sustainable means. a) A Ticket Price Master Plan for all soccer leagues. b) A Stadium Master Plan. c) An Entrance Fee Master Plan. d) A Promotion and Relegation Master Plan – including very specific reasons why and how a promotion and relegation system will work in the US and in the new association with its leagues and clubs. All of these significant topics, among others that will be covered within them, will be released freely online for the entire soccer community – inspired by Dennis Crowley’s Open Source Soccer mantra. These documents will be available before the proposed summit will take place for everyone to read, study, discuss, and pursue. The goal for the first three years is to have teams promoted to the top divisions in order to populate them. No relegation will occur during the transition period. By the fourth year, once there are enough clubs in all the divisions across every region, then Promotion and Relegation will begin full force under merit of play. All topics including Parachute Payments, TV Revenue Sharing, Marketing, and other financial benefits and incentives will be completely addressed in the aforementioned documents. Therefore, starting with 2018, the leagues will be aligned and each year clubs will be promoted through all the divisions. The secret ingredient to making promotion and relegation in the USA to be absolutely successful is actually Interleague Play. a) tremendously cutting down on travel costs for clubs and fans, thereby potentially increasing stadium attendance for away supporters and raising the entire stadium experience. c) giving the clubs in a lower division the opportunity to play against clubs in a higher division during league play which raises their profile and potential revenue stream. While the pyramid is being constructed within the next three years, with teams primarily being promoted and no relegation taking place yet, Interleague Play will be the valuable component that will bridge all the divisions together. D1 clubs can play D2 clubs, D2 clubs can play D1 and D3 clubs, D3 clubs can play D2 and D4 clubs, D4 clubs can play D3 and D5 clubs. By implementing Interleague Play, all clubs will be seen by their fans as important no matter division and it will help build the invaluable belief that any club can be successful and reach the top. This also puts a much deeper meaning to every game counts, as Interleague Play will strategically affect all the connected tables. Meaning that Promotion and Relegation and / or winning a Championship will be influenced by winning games against all opponents and taking each game seriously no matter the division they’re in. A club from one division can affect a club in another division to be promoted or relegated in a given match. Each week, there will always be a battle between David and Goliath which fans enjoy to watch in person and on TV. This component will increase the profile and visibility of the clubs and the leagues combined. The moment has arrived for all the clubs and leagues in this proposal to unite and start a new era of play in 2018. 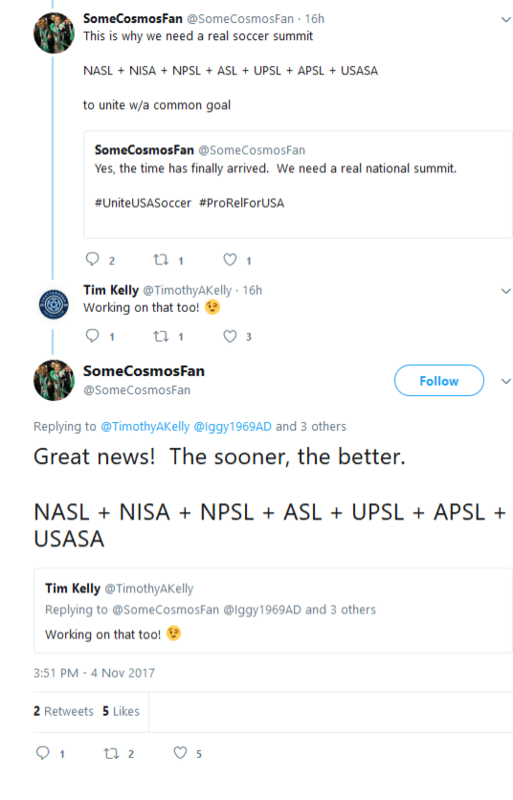 The NASL should astutely go on as planned with its expansions clubs, while connecting to all the above leagues, under the new association that would be linked to USSF. NASL can start as D1 and NISA can start as a D3 for the new association. By 2019, some clubs from NISA can move to NASL D2, and some clubs from NPSL can move to NISA D3. By 2020, there should be 24 clubs in each of the first three levels, and by 2021 full promotion and relegation will take place between them. By 2022 and 2023, full promotion and relegation will include the NPSL D4 and the regional D5 leagues. The continuing years will include the other divisions all the way to D10 and beyond. Furthermore, in collaboration with the MASL, outdoor clubs can field indoor teams in the MASL during the winter while existing MASL clubs can also field outdoor teams in order to link the sport. 2018 can be a historical and positive year for soccer in the US. Clubs can unite and together triumph. Once this pact is solidified by the clubs and leagues, plus the new association and the promotion and relegation system are formed at this summit, then as a unit the association and its member representatives, with the actual plan in hand, can meet with USSF during the same or following week. The association and its clubs and leagues can be approved by USSF, and it can launch in 2018. Eventually, CONCACAF Champions League (CCL) berths can be pursued. The first ever true National Soccer Summit was held on April 5th, 1913, under a similar necessity. On that day the United States of America Football Association (USAFA) was formed – present day United States Soccer Federation (USSF). People from all over the country were invited and arrived for the greater good of the game. At the time, an array of regional associations and leagues existed, but they were all independent without true unity. No one thought a summit of this kind was possible, but it succeed in creating a national association and the US Open Cup as a national championship. Approximately a hundred years later, due to the vast growth of the sport across the country, a summit of this caliber needs to be called upon once again and placed into action to unite the clubs and leagues mentioned above as it is paramount for the present and future success of the sport in the USA. In truth, people everywhere in the soccer community want to see a soccer summit of this magnitude take place. It is long overdue. There has been discussion throughout the internet and behind the scenes, and now with this proposal, people can move forward. Grab the bull by the horns and do it! Part To Make This Happen! Get On The Phones! Rally The Troops! You Are All Stronger Together As One! Editor’s Note: The contents of this article have been edited to properly denote the governmental or social head of a geographic region, rather than the building in which the people who oversee those operations, work. We hope that this allows everyone to continue reading. A couple of anonymous people on Twitter are excited about it, so everybody please fly to New York on short notice and we’ll book meeting space in the most expensive city in the country at the busiest time of the year! And then, we will all click our heels and say, “There’s no place like home” and we can skip the security line at LaGuardia! How desperate are you people? You are not going to create an association, you have no money and standing up in front of a ballroom of like-minded dopes is not going to make your SimCity fantasies come true. Stopped reading as soon as this genius referred to NYC as the financial capitOl of the US and the world ( it’s capitAl for you Cosmos fans out there). This site is becoming as bad as Empire of Soccer. Editor’s Note: That is my fault for missing the typo. We hope one day to one day be as bad as Howler, SBI or FourFourTwo as well. Keep trying. I’m sure you’ll get there.